To create livelihood for the local people’s organization (PO) through mud crab farming and to increase awareness on the importance of mangroves, Junior Chamber International – Makati Princess Urduja Incorporated (JCI-MPUI) invited SEAFDEC/AQD to conduct a training course on mud crab culture last 29 July 2017 in Calatagan, Batangas. 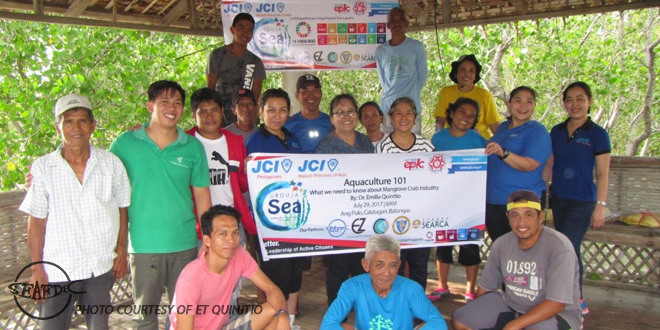 The local PO was in-charge of maintaining a mangrove sanctuary called Pulo in an islet in Calatagan which inspired JCI-MPUI to create a marine ecosystem project that will benefit the community and its members. SEAFDEC/AQD scientists Dr. Emilia Quinito and Dr. Fe Estepa gave lectures on mud crab biology, nursery, and grow-out techniques for ponds, cages, and pens. SEAFDEC/AQD will also provide technical assistance in setting-up cages and pens for mud crab culture in mangrove areas. The activity was spearheaded by JCI-MPUI that has been promoting active citizenship by empowering young individuals, especially women in the community, for business development, responsible leadership and heroic values, and international goodwill for 37 years. 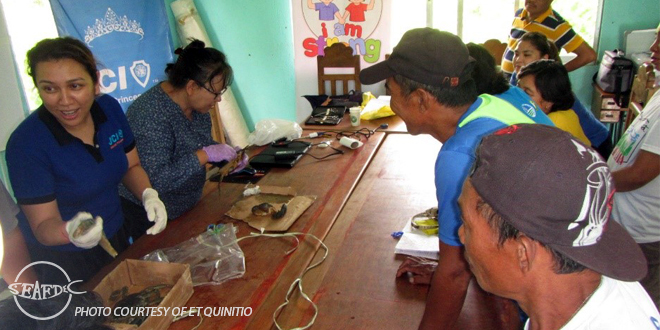 The activity was also in partnership with the Bayan ng Calatagan, Enrique Zobel Foundation, Climate Change Commission – Philippines, and the Southeast Asian Regional Center for Graduate Study and Research in Agriculture.